Mouth cancer refers to cancer that develops in any part of the mouth. Mouth cancers can occur on the lips, gums, tongue, inside lining of the cheeks, the roof of the mouth as well as on the floor of the mouth. Cancer that occurs on the inside of the mouth is called oral cancer or oral cavity cancer. There are several types of mouth cancers that are grouped into categories called head and neck cancers. 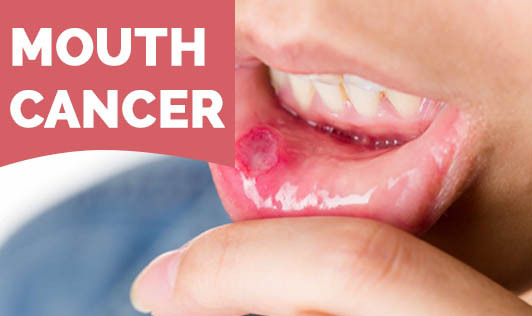 Mouth cancer occurs when cells in one's lip or mouth develop changes (mutations) in their DNA thereby allowing cancerous cells to grow and divide and healthy cells to die. This results in the accumulation of mouth cancer cells that form a tumor. It is not quite clear as to what causes these mutations that lead to mouth cancer. If you have persistent symptoms that are mentioned above which last for more than two weeks, see your doctor for a proper evaluation!